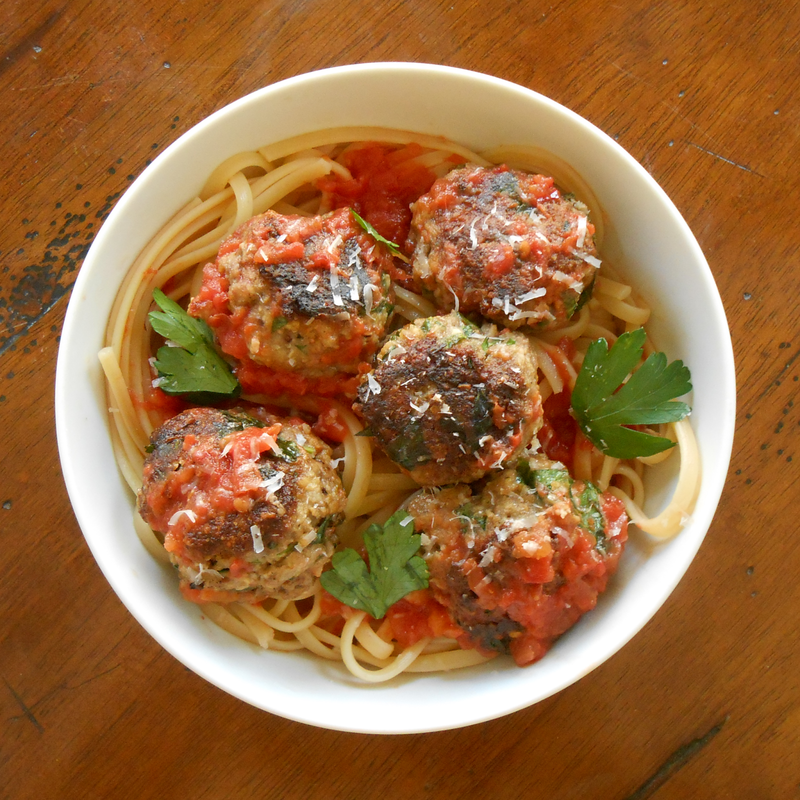 We were in the mood for regular meatballs that would work in a regular Italian tomato sauce. After reading the Chowhound forums, we learned that milk and bread are what bind and tenderize meatballs in most recipes. Dilemma: no usable bread and our breadcrumbs were settled at the bottom of a bag marked, "Expires July 2011." Matzo meal, on the other hand, was bountiful (and conveniently in season, though the meat/dairy/pasta combination means this dish is definitely not kosher for Passover). The savoriest meatballs are also browned and seared, developing a flavorful crust to provide textural contrast to a melt-in-your-mouth interior. You're here for easy and impressive, right? 2. Mix together all ingredients except oil, tomato sauce, and water. Check meat mixture's seasoning by cooking a teaspoon of it in a small pan. Taste for salt/pepper/cheese/parsley. 3. Form meatballs that are ping pong ball-sized with an ice cream scoop or your fingers and roll them lightly between the palms of your hands. 4. Heat oil in skillet over high heat until smoking. Add meatballs in a single layer, making sure not to crowd the pan (you may have to sear them in two batches). Sear until the first sides are browned, around 2 minutes. Flip each meatball and sear until the second sides are browned, around 2 minutes. Transfer meatballs to a parchment-lined baking sheet and wipe down skillet with paper towels. 5. Roast meatballs until the centers are only slightly pink, around 7 minutes. Go ahead and cut one open to check. 6. Return meatballs to skillet. Add tomato sauce and water and place over medium heat. Simmer, basting occasionally, until the sauce has reduced to a nice glaze that coats the meatballs, about 5 minutes. 7. Serve with spaghetti and more tomato sauce, topped with a little more cheese.